OS X Yosemite (like previous versions of OS X) has four different views for navigating your files: Icons, List, Column, and Cover Flow. Each is distinctly different, and each has its own strengths and weaknesses, but if you learn them it will make navigating your Mac much easier and more productive. These are the view options you're looking for. Let's start with the oldest of the bunch, List View. 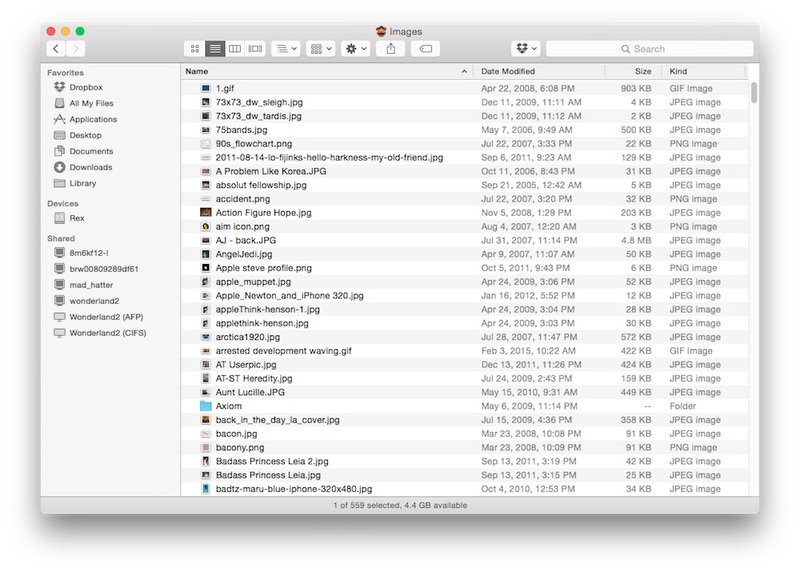 This is the old school Finder window you may remember from your youth, if you're old school. And if you prefer a...well, a list of the files/folders in a particular directory, showing information like File Size and Date all at once, then List View is for you. For keyboard junkies, type a couple letters and jump to the item in the list, and if it's a folder, right arrow will expand it into your view. In fact, this is how I configured all my windows basically from forever until earlier today, when Bryan Chaffin explained why he uses the next view on our list—Column View—for everything all the livelong day. List View has the advantage of being orderable by Name, Date Modified, Size, and Kind. 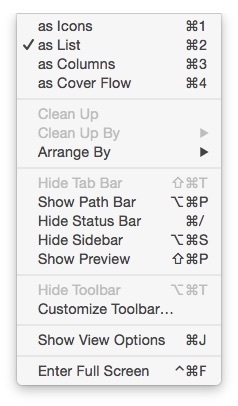 It's these options in particular that keep List View relevant in an age of gorgeous icons. Behold the List View of my Images folder. And yes, that's a Fozzie Bear folder icon. In Column View, unsurprisingly, you find a much narrower list of items, shown alphabetically. One might even refer to it as a column. There's no date or kind information next to items as in list view, but if you select a single item you get all that information, plus a giant preview of the item itself. 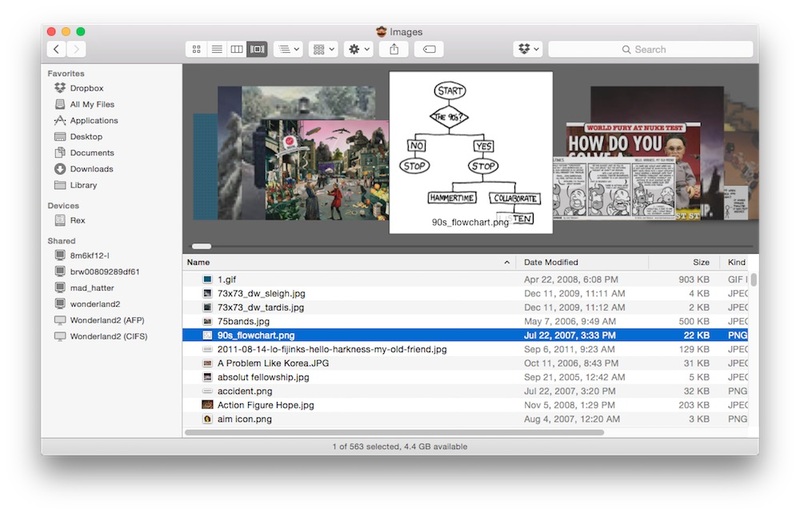 If you wade through folders within folders often, looking for images or other items that are easily distinguishable with a preview, this view saves you the work of having to QuickLook everything, and has the added bonus of leaving a trail behind to help you navigate more efficiently. If you use the keyboard shortcuts to navigate forward and backward, you'll get there all the faster. Note: This view is always alphabetical; if you need different views listing by other criteria, look at List View instead. Column View's greatest strength is that it gives you the most amount of information in a glance, especially for files. You can see the icon, but it's not taking up massive amounts of space as with Icon mode. 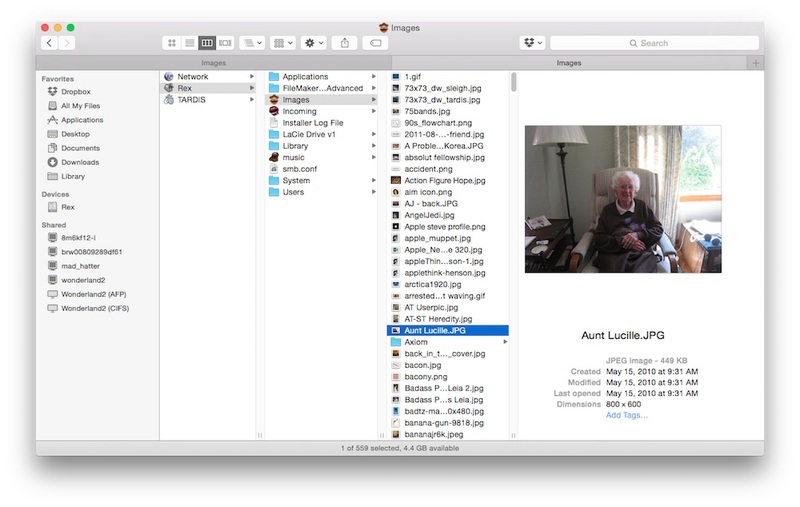 In the Preview pane, you will also get a preview of the contents, the file size, date created and modified, and information about what kind of file it is. Hey look! It's my (great) Aunt Lucille! Hi Aunt Lucille! In Icon View, each item is represented as an individual icon, similar to what you see if you have items on the Desktop of your Mac. You can adjust the size and spacing of the icons in that window, and that can give you a way to optimize that view. Keyboard commands here are just the arrow keys, moving in all four directions since it is just icons in a folder, not necessarily sorted by anything. You can sort by whatever you like here too, but the information isn't visible in the folder, you just see the order of items change from left to right in rows down the window. If seeing larger icons for things is helpful, then maybe icon view will help in some situations. Icon View is essentially a holdover from Mac OS days. It gives you the biggest icon views, but at the expense of not seeing very many files at one time. This is icon view. I have a wide variety of images in this folder. Behold them. Cover Flow looks like the old view in iTunes where it was like flipping through your albums. This can be helpful if you have a folder full of images, or a folder full of...pictures. Apple doesn't even seem sold on this view anymore, since the most useful place for it, iTunes, stopped including it as of version 11 (and we're at 12 now). Clicking column heads will sort by whatever you like, but navigating the folder only brings the file in question to the center of Cover Flow. I'd love to say something useful about Cover Flow, but it was originally designed for selecting music in iTunes based on cover art, and I know few people who use it in the Finder. Another sampling of the wide variety of images in this folder. Via Cover Flow. Generally I have spent my time in List View, but I am going to give Column View a shot since it looks like I can navigate more easily and I can get more info on the screen at once. Bryan Chaffin told me he lives in Column View, but switches to list on the rare occasion when he needs to reorder the contents of a folder by some criteria other than name. By and large, the option for which one works best will usually become clear when you know you have four of them to choose from, and how to switch them.